When mom Lin Kramer visited Party City’s website to look for a Halloween costume for her 3-year-old daughter, she was very disappointed by what she found. 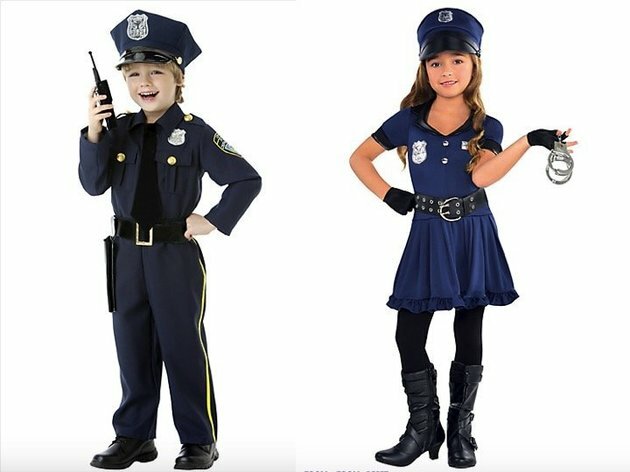 The “Toddler Costumes” section revealed a discrepancy between the offerings designated for boys and those for girls — particularly in the category of career-related costumes. While there was a wide selection of empowering costumes marketed for boys, girls were left with sexualized and diminutive versions of these costumes and significantly fewer career-based options. Unwilling to simply shop in the “boys” section or silently taking her business elsewhere, Kramer wrote an open letter to Party City. “Please, Party City, open up your view of the world and redesign your marketing scheme to let kids be kids, without imposing on them antiquated views of gender roles,” Kramer wrote in her letter, which she posted on her personal Facebook page and Party City’s page on Sept. 14. In her letter, the mom breaks down some of the differences between the “girl” and “boy” versions of certain costumes — from the way they’re labeled (“precious pirate” versus “rascal pirate”) to the online descriptions (“cute cop” and “sassy and sweet” versus “realistic scaled-down police shirt” and “this protector of the peace has it all under control!”) to the outfit designs themselves. Toward the end of the letter, Kramer suggests that Party City simply include the toddler costumes from the boys section in the girls section as well. She also emphasizes her mission of inclusiveness. “While there is absolutely nothing wrong with little girls who enjoy and want to dress up this Halloween as a ‘Light Up Twinkler Witch,’ or a ‘Doo Wop Darling,’ or an ‘Enchanted Stars Princess,’ there is also absolutely nothing wrong with little girls who might wish to give the ‘UPS Driver’ costume or the ‘Ride in Train’ costume a try!” she says. Feeling that Party City’s Facebook response left something to be desired, Kramer shared her letter with a local current events group she’s involved with online, but after other members requested a link to her post on Party City’s page, the mom saw that her letter had been deleted. Kramer says she posted her letter on the page again and found that within 20 minutes, that post had been deleted as well. She then discovered she had been blocked from commenting, sharing and writing posts on the Party City Facebook page. “Incensed at the censorship of a perfectly civil consumer concern, many members of this small internet group began sharing the letter from my page,” Kramer told HuffPost, adding that she shared her story with Women You Should Know, which led the letter to gain more traction. Within 24 hours of that article’s publication, the mom regained the ability to interact with Party City’s Facebook page. Party City values customer feedback and appreciates our customers taking the time to share their opinion with us. Nothing we carry is meant to be offensive and we supply Halloween costumes suitable for all styles, tastes, and budgets. We expect parents to be as involved in their children’s costume selections as they are in selecting their everyday wardrobe, and we encourage parents to shop with their children. We supply the types of products that our customers, and specifically parents, demand, and the Girls Cop Costume mentioned by Ms. Lin Kramer is one of our most popular costumes. We understand this is a sensitive issue. Party City is always evaluating how to make shopping in our stores and online a fun, welcoming experience and her feedback has been shared with the costume manufacturers and leadership teams at Party City. If Ms. Lin Kramer would like to speak directly with a Party City team member, she’s welcome to contact us and we hope to connect with her soon. The mom told HuffPost that she also hopes that Party City and other businesses will be more willing to foster open dialogue about these issues. As for Kramer’s daughter, the toddler has recently taken an interested in Mary Poppins, so her parents are acquiring materials to make a DIY costume of the classic Disney character. Read more about this at the Huffington Post.